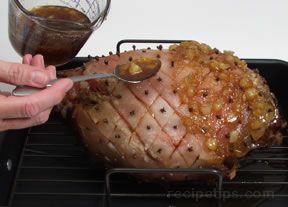 Ham glaze adds to the appearance of the cooked ham, enhances its flavor, and many times extra glaze is set aside to be served along with the ham. The sweet flavor of the ham glaze is a nice contrast to the saltiness of the ham. The two complement each other nicely. Glazing a ham is done as the last step in the process of cooking a ham. It is not necessary to glaze a ham when cooking it but it gives the ham an attractive finish and provides additional flavor. A glaze is most often sweet and can be made from a variety of ingredients, such as sugar, brown sugar, honey, jam, marmalade and fruit. 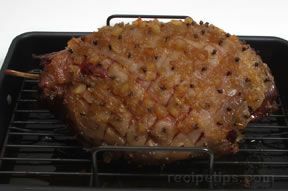 Other flavorings and seasonings used in ham glaze recipes are mustard, vinegar, cloves, cinnamon, and ginger. When adding a glaze to an uncooked ham, the ham should go through the full cooking process before the glazing takes place. The ham should reach an internal temperature of 160° F to ensure that it is fully cooked before glazing. When adding a glaze to a fully cooked ham, the glaze should be added during the last 20 to 30 minutes of the cooking process. The glazing process is basically the same for each. Shown below are basic glazing instructions. A simple glazing recipe is shown below but any glazing recipe you prefer can be used. Pour the drippings from the pan. Drippings can be discarded. Remove the rind and trim the fat, leaving approximately a 1/4-inch layer of fat. (This step is optional.) Score the fat by making diagonally cuts in one direction and then making cuts in the opposite direction, forming diamond shapes in the fat. A clove can be stuck in the middle of each diamond if desired. To make glaze, combine 1 cup of brown sugar and 3/4 cup of pineapple, slightly drained. Spoon or brush glaze on the layer of fat. Place glazed ham in the oven and bake at 375° F to 400° F for 20 to 30 minutes or until the glaze has caramelized and turned a golden brown. Watch carefully because glazing can burn easily. Remove from oven and carve. "Sounds good, but not the sweat flavor! Sweet maybe ..."